Kovels' Top 20 list of antiques and collectibles searches for April 2013 shows collector interest in banks, pressed glass and Goebel. Three new collectible interests—banks (No. 12), pressed glass (No. 16) and Goebel (No. 20)—have climbed into April's Top 20 list. Prices for mechanical banks can be thousands of dollars. But still banks cost from $15 to $100. Iron still banks have attracted new collectors—the "iron" collectors who buy doorstops, bottle openers and other figural pieces. Unusual iron still banks are now $100 and up. Iron piggy banks with embossed advertising start at $150. Pressed glass is part of the newest decorating trend. It's down in price so it's both fashionable and thrifty. Many collectors previously uninterested in pressed glass are trying to assemble sets made of many different patterns. Dining room chairs, table silverware and sets of glassware are now used in modern homes. A dinner party table with each goblet in a different pattern will not only look great but will spark conversation. Goebel is the German company that manufactured the famous Hummel figurines that were a top collectible from the 1960s until the 1990s. In 2008 Goebel stopped making Hummels. Collectors lost interest and prices fell. Accurate current prices are at Kovels.com. Collectors who search Kovels.com always want to know more—about descriptions, marks and prices. 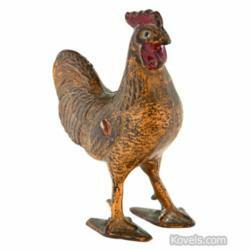 Kovels.com and "Kovels' Antiques and Collectibles Price Guide" list thousands of current prices in hundreds of categories that are carefully selected and edited. The online website, Kovels.com, created by Terry Kovel and Kim Kovel, provides collectors and researchers with up-to-date and accurate information on antiques and collectibles. Kovels’ Antiques was founded in 1953 by Terry Kovel and her late husband, Ralph. Since then, Kovels’ Antiques has continually published some of America’s most popular books and articles about antiques, including the best-selling “Kovels’ Antiques and Collectibles Price Guide,” now in its 45th edition. The Kovels’ website, online since 1998, and free weekly email, “Kovels Komments,” give readers a bird's-eye view of the market through up-to-date news, auction reports, an online Price Guide, a Marks Dictionary, readers’ questions with Kovels’ answers and much more.